(up to three) Držiteľ Rytierskeho kríža s Dubovými ratolesťami. 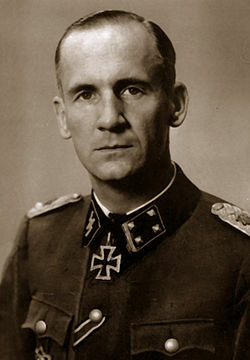 Recipient of Knight's Cross of the Iron Cross with Oak Leaves. DD.MM.1935 - DD.MM.1936 - 2. Lehrgang, SS-Junkerschule "Bad Tölz"
DD.MM.RRRR - DD.MM.RRRR – Velitel čety v SS-Regiment "Germania"
DD.MM.RRRR - DD.MM.RRRR – Velitel roty v SS-Regiment "Germania"
? ?.10.1944 - 10.3.1945 – Náčelník štábu I.SS-Panzer-Korps "Leibstandarte"